A boat lift is perhaps one of the best investments you can make in your waterfront lifestyle in Port Richey, Florida. Imagine being able to take your boat out on the water whenever you’d like without having to deal with tedious tasks, like trailering your vessel and driving it to and from storage. And, if you currently keep your boat in the water, a boat lift will prevent costly problems, such as corrosion and organism growth on the hull. DECO Boat Lifts has been an industry-leading boat hoist manufacturer since 1959 and has long maintained a reputation for manufacturing top-quality lift systems that offer exceptional performance and reliability. If you’re looking for an entry-level system, then our Maxi Lift – which is incredibly cost effective and has lift capacities of up to 16,000 lbs. – is the perfect option. We also offer our flagship DECO Lift, which has many proprietary features to enhance performance, such as a sealed gearbox design that reduces maintenance. 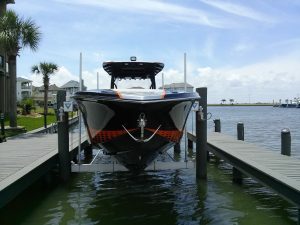 And, we’re proud to offer the industry’s most advanced boat lift – the Concept CRS Lift. This boat hoist delivers unparalleled lift performance and requires little maintenance thanks to its direct drive system. It also comes standard with our patented Cable Retention System (CRS), which features deeply grooved winders that keep cables from overlapping, thereby reducing wear. Additionally, we’re proud to offer our lifts in a variety of configurations to suit your unique vessel and docking scenario. If, for example, your property is in a narrow canal where a standard boat lift can’t be constructed, we can provide a boat elevator that can be mounted directly to the seawall. We also offer an incredibly powerful and low-maintenance Beamless Lift among a variety of other options. Learn more about the many boat lift systems and configurations that we offer in Port Richey, FL, by contacting DECO Boat Lifts today. We offer the fastest, quietest and most dependable boat lifts on the market today. Click the button to view our gallery. Do I Need a Lift for a Boat? How Does A Boat Lift Work? How High Should a Boat Lift Be? How Many Pounds Boat Lift is Needed? How Much Does a Boat Lift Cost? What Kind of Boat Lift Do I Need? What type of boat lift do I need? Where Should I Store My Boat? Why do I need a Boat Lift?